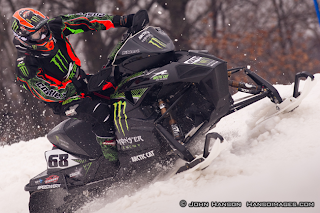 March 14, 2012 – Tucker Hibbert, the defending ISOC National Snocross Pro Open Champion, is set for the final ISOC event of the season this weekend in Lake Geneva, Wisc. Hibbert will not be fighting for the title at the Nielsen Enterprises Grand Finale at Grand Geneva Resort but will be contending for the final two Pro Open wins of the season. In February, Hibbert missed two rounds of the ISOC Tour after they were rescheduled for the same weekend as the 2012 FIM Snowcross World Championship. Hibbert traveled to Russia to represent the United States and went on to win his second world title. While in Russia, he missed the opportunity to compete for 90 ISOC Pro Open points – dashing his chances to defend his title. 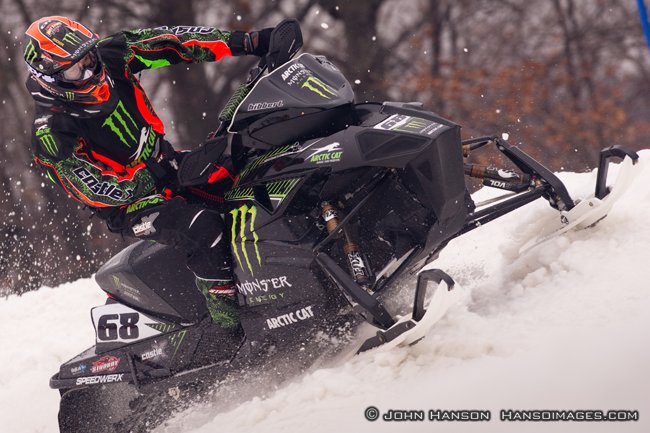 Hibbert is hot off a perfect run last Saturday at the ERX National in Elk River, Minn. He hopes to carry his winning momentum into this weekend’s Grand Finale event. Pro Open racing kicks-off Saturday at 2 p.m. with the final at 5:30 p.m. Sunday’s Pro show runs from noon to 6 p.m. Fans can stream the event live online at www.ustream.tv/xsan-isocacss and catch the behind the scenes action on NBC Sports Sunday, April 29 at 5 p.m. EST. When: Thursday, March 15 from 5:30 to 7 p.m.
Monday afternoon, Hibbert will catch a flight to Sweden to compete in the Super Snowcross event at Clash of Nations (CON) March 23-24. CON will also feature Freestyle Snowmobile along with Snowboard and Ski Big Air.